It's that time of year again where Cambridge is turned into a cryptic crossword of criss-crossing Art across the city centre. Art Language Location is a festival we really believe in at CollectConnect, where the Art populates public places and inquisitive creative bloodhounds are rewarded with thought provoking urban vignettes. It is the brainchild of artist Robert Good who we have had the pleasure of featuring on Freedbook, Fab Fridge 2014 and most recently the excellent 'On The Map' exhibition. Now in its fourth year, Art Language Location (ALL) , 2015 is proud to welcome work by nearly 70 of the brightest emerging and established artists from across the UK and beyond who use text in their work. ALL is a contemporary visual and performance arts event taking place over two and a half weeks in October 2015 in Cambridge, featuring prestigious, innovative and experimental contemporary art. Join us at Anglia Ruskin University campus and around Cambridge in October for this year’s festival, which is bringing exciting new work to Cambridge. Each artist has found an appropriate venue for their work: the resulting intervention creates a conversation between artist, artwork and location. This extended exhibition aims to show a series of visually exciting and unexpected encounters in which our everyday interactions with text can be explored and challenged. 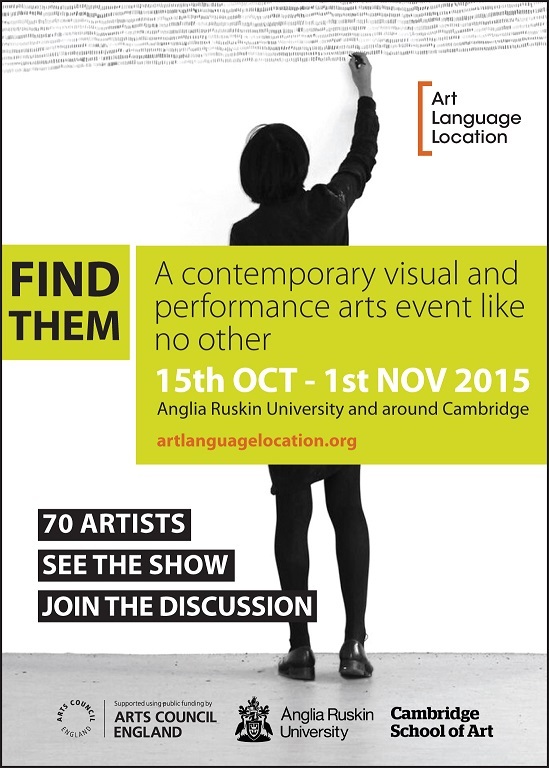 Highlights include Supertext, an exhibition of Art and Text around the campus at Anglia Ruskin University (ARU). With over 20 works to find, you are invited to track down adorable shaggy dogs (and stories) by Tom Hackett, a multilingual Winnie-the-Pooh (plus aprons) by Laima Vanaga and an argument between Daniel Djamo and his mother. And we'd love to see you at ShowTime! on October 17th, also at ARU, for a full day of participation and performance. Take part in an interactive audio drawing by 2015 Jerwood Prize Winner Alison Carlier, listen to a new choral work by Ian Wolter and have your nails done as never before. Sample local street food by Food Park, and round off the day with live music and bar. There is a Launch Party on 15 October at The Junction, Cambridge, which will be opened by Molly Jackson of the South Bank. ALL is going from strength to strength, building a reputation for Cambridge as a place to visit for contemporary art - ALL2015 is the fourth annual event, which began with Text&Context in October 2012. We want to bring new and experimental art to Cambridge and contribute to what is becoming a growing and exciting contemporary arts scene. Join us in October and see for yourself. See you there! Check out our website www.artlanguagelocation.org for full details.